For this hand tied bouquet, I love using miniature spray carnations. 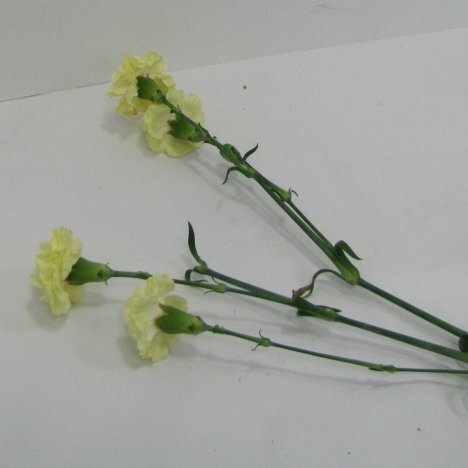 They are available in a lovely range of colors and have three to four (or more) flowers on a single stem. I tucked a single stem down into the center mass of hydrangea to break up the face of the flower and add some contrasting texture. 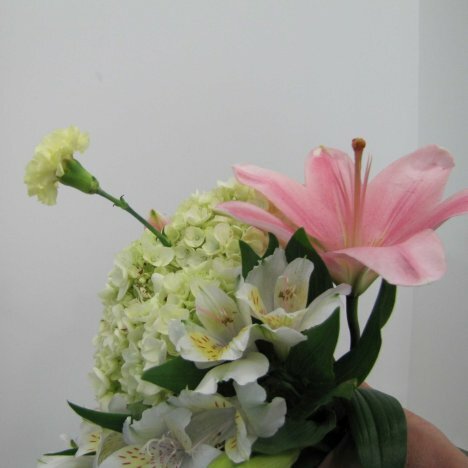 The soft buttery yellow blends well into the muted greens and blushing pink of the bouquet. 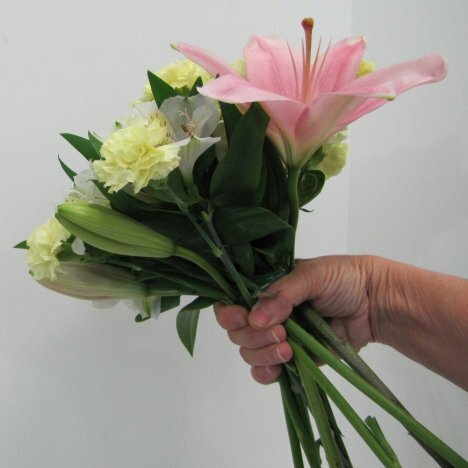 The bouquet stems grow thicker with the addition of each new stem. Again - don't be afraid to cluster masses of the smaller headed flowers together to make more of an impact. 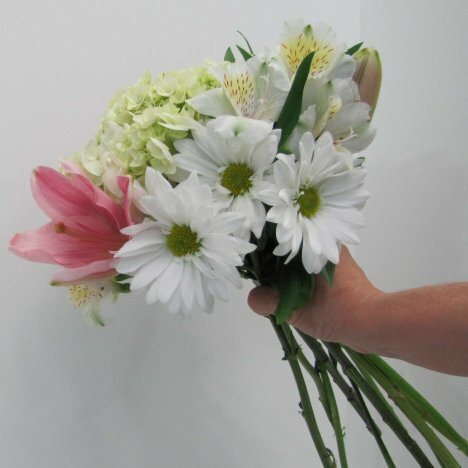 This fresh spring bouquet is going to be lightened with the addition of the chrysanthemum daisy. The heads are large, round and usually have several laterals on each main stem. 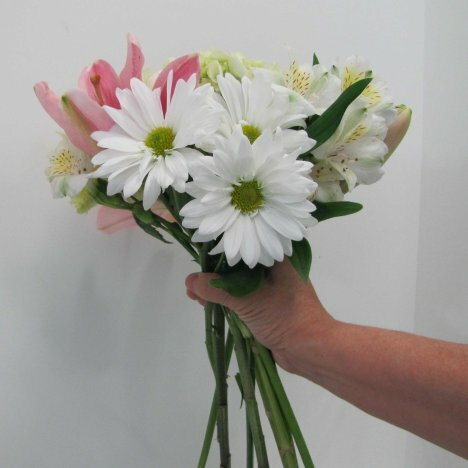 They are well suited for a hand tie because the flower is very hardy and long lasting. 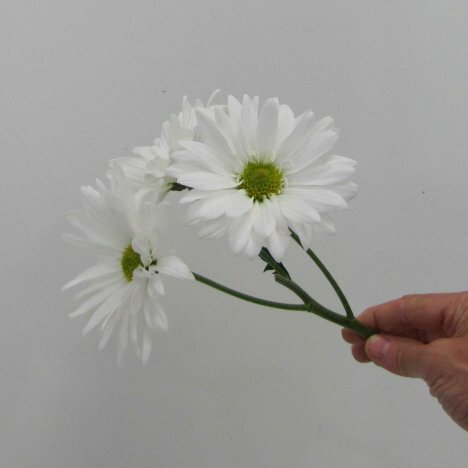 I cross the stem, adding it to one side of the bouquet with several of the daisy heads massed in one spot. At this point I am taping my flowers in place, as the bouquet is getting rather large to hold the stems in place. 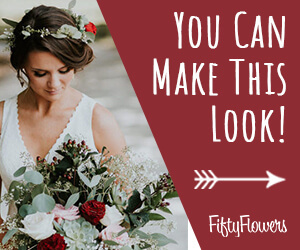 That way I can relax my grip or even rest the bouquet in a dry flower vase if I need to answer the phone or stop the design for a few minutes without losing the shape of the bouquet.